"What will it cost me to get it here?" Our Answer: "The quoted price we give you is the price you pay*. Delivery included!" Serving the Midwest region (KS, MO, OK, AR) through our headquarters in southeast Kansas and sales offices located in the Kansas City Metro market, Pittcraft considers a number of mid-western cities as "local markets" resulting in a delivery directly to their customers doorsteps via company owned vehicles. The quality of your project is our number one priority. This includes getting it to you in tip top shape, on time, and with a smile from one of our own employees who understands and displays our customer service values on a daily basis, directly to your location. 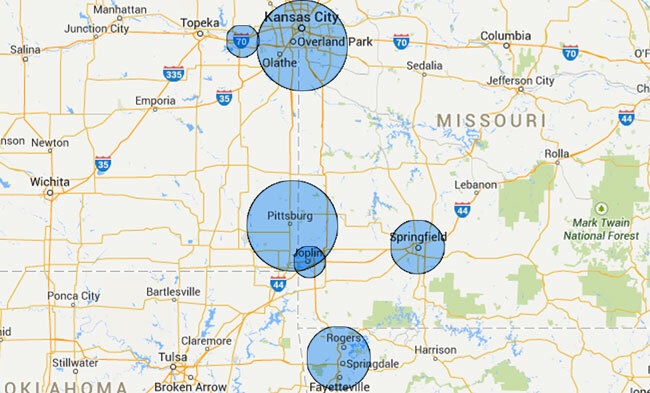 Cities located in and around the Kansas City Metro and Lawrence, Kansas Markets, Springfield and Joplin, Missouri Markets, Tulsa, Oklahoma Market, and Northwest Arkansas Markets are all considered local in Pittcraft's eyes and will qualify as a local delivery. For projects that may not have an end to their journey within one of these markets, there are no worries; Pittcraft has the capabilities of serving clients from coast to coast, and currently have accounts even requiring international shipments. * Not every order or location qualifies as a local delivery. Please check with your sales representative to see if you are located within the areas that we determine as local deliveries. Destinations not located within these areas may result in shipping charges to your location.